This Week's Dose: '14 RB Situation, The Offer Train Continues, Last/This Week's Visits, New Walk-on Commit, and OT. 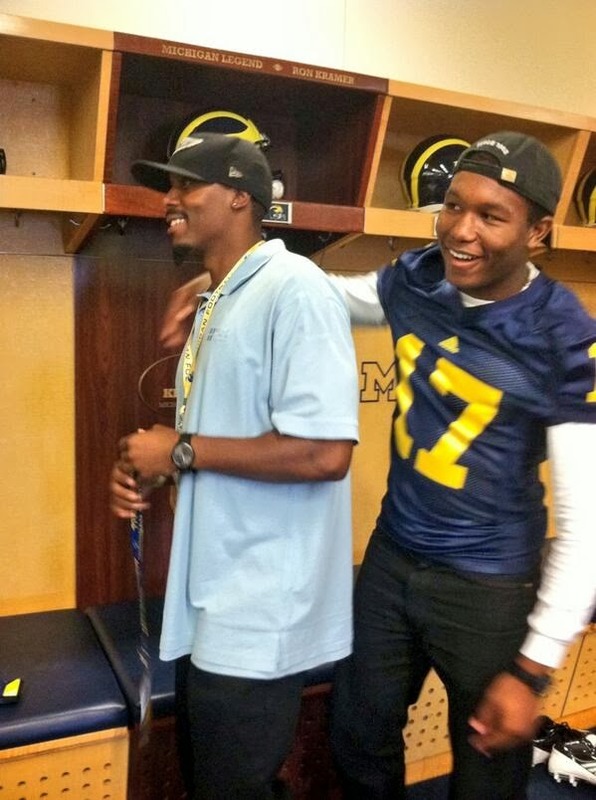 It could be quite the boring signing day for our beloved Michigan Wolverines. The word on the street is Hoke and co. have shut down recruiting a running back for the '14 class, and may have shut down recruiting the '14 class as a whole. Of course, this does not include newly ranked 5-star (Rivals) DE Malik McDowell. More on that later. This 2014 RB situation is peculiar. I talked with Jeff Jones last night and he was still planning on visiting AA on Jan. 31st. Jones, a current Minnesota commit, is rumored to be having trouble qualifying for Michigan and now with today's news, it may not be a rumor anymore. Mack was a fresh name to the scene (offered last week) and Michigan looked to be picking up steam following a de-committed from UCLA over the weekend. Guess not. Another name Michigan was back in contact with as of last week, is Kalen Ballage. Ballage went under the radar for a while and Michigan seemed to be out of the running. Guess they still are. This is a cloudy situation and one that's been a carousel all season. This could be the end re: taking a RB in the '14 class. Now back to McDowell, who took a visit to FSU over the weekend where Jimbo Fisher and staff impressed the MI prospect greatly; and unless you've been under a rock lately, things are definitely not trending Michigan's way as of late. Michigan State seems to be the team to beat now and even though he enjoyed FSU, the belief is that McDowell wants to stay close to home. Michigan has an uphill battle in front of them and just may be done for the '14 class as a whole if McDowell takes his services elsewhere. '15 OL Jake Fruhmorgen hails from the sunshine state and is one of the top offensive lineman in the country; he's another guy OC Doug Nussmeier is high on. His father played for 'Bama and later, The Dolphins; so the bloodline is there. Saying that, I think Fruhmorgen is open-minded to all schools (not just his dad's alma mater) and Michigan has a shot here. -The most important visit last week happened in my home state of Kentucky, as Nussmeier made his first stop as an assistant at Michigan to Madison South, the home of '15 commit Damien Harris. I haven't heard any news relating to how the visit went; no surprise as Harris and his family aren't to vocal when it comes to the recruiting process. -Coach Ferrigno, among others, will be heading out to Californina to check out '15 QB Kyle Kearns and someone whose been waiting a long time to for this staff to visit, '15 DE Keisan Lucier-South. An offer is likely for KLS and that would put Michigan at the top of his list immediately. -The former Mayor, WR George Campbell, did in fact receive a visit from the staff while they were making their rounds in Florida last week. Campbell received offers from Alabama and Missouri as well. -One of Michigan's top player's in '15, ATH Brian Cole, received an in-school visit last week. -'15 QB Brandon Wimbush was visited by Coach Roy Manning last week. Wimbush is a duel-threat QB from NJ. -A new name that Michigan is interested in, Long Snapper Andrew Robinson, an in-state kid out of Troy Athens. Kyle is one of the top combo prospects in the class of 2014. He has as much potential as any specialist we have ever worked with in Michigan, and that includes numerous Division 1 scholarship athletes. At the September 2013 Michigan Fab 50 Camp, Kyle charted a kickoff of 77 yards/4.0 HT. His 5 kickoffs averaged 71/4.05. His first 6 punts charted 4.22/38, 4.53/45, 4.09/30, 4.25/43, 4.4/44, and 4.4/48. We don’t say this often, but Kyle has NFL potential. I like to hears the words "NFL potential" is any evaluations no matter what position is being discussed. I wouldn't say this helps or hurts Michigan chances, but is interesting to note since his offer came not to long ago. I hope they don't offer another long-snapper. Two on the roster for 3 years? ?